The Random Number Generator told me that Sue in Australia will be the lucky recipient of the Patrones magazine! She is part of the BWOF sisterhood, so I'm thrilled to be sending another awesome pattern magazine her way. Sue, my email address is in the right sidebar, please write me with your mailing address. There was an impressive range of answers to my query, "what's on your must-sew list this season?" I thought I might spot a trend, but it seems there's quite an assortment of coats, dresses, pants, and tops in our futures! I went to the first of my two "patternmaking 101" classes on Monday. The instructor worked at a local sportswear manufacturer, so she spoke a bit about pattern development "in the industry". She showed us how to mark patterns, how to walk a pattern, how to move darts (very cool! 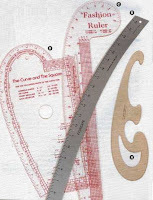 ), and how to add a yoke, facings, or a buttonband using a bodice shell pattern that she provided. I'm sharing this just because my adrenaline is still pumping about it... The semi-short version: I'm standing downtown today around 6pm waiting for my bus to go home, iPhone in hand and earbuds in listening to music. A teenage boy walks up to me, swipes the phone out of my hand and takes off running. I chase after him, screaming at the top of my lungs "Stop him! Stop him! Stop him!" while everyone stands there and watches like we are filming a movie or something. A Good Samaritan, no, an Awesome Samaritan, named Neil joins the chase, and after about 4 blocks he gets my phone back, right as the police intercept. The kid gets arrested, I get my phone back, and Neil gets thanked profusely by me while the police write up the report. Holy %%%%%%%%%$4$$. can't believe that about the iphone!!! so glad you got it back!! Don't you just love texting on it!! text me anytime 831-331-5796 when you need to get rid of some guilt after purchasing fabric you don't need! Gosh, I can't believe that happened when there were so many people around. What kind of world is this? That looks like an awesome issue of Patrones. Happy to hear you got your phone back. Yikes, I'd probably be too - something - paralyzed by shock maybe, to go chasing after the guy. Glad it all turned out ok in the end. As for plans for this fall - mother of the groom dress and coat, and making some clothes to wear to work, for myself for a change...jackets, skirts, pants. Finishing UFO's - bunches of them. No Way!!! I'm so glad you got your phone back. There are some awesome people out there in the world to counter-act the rotten ones. So glad you got it back! That's one of my fears about getting it. I once saw someone swipe this woman's phone off the metro right before the doors closed. Before she could get out after him, the doors shut and the train left the station. So sad. Glad you got your phone back, good for you for having the presence of mind to yell (as Marji said I would probably have been frozen in shock) , and isn't it good there are still some Neil's in the world. Yay for good people. I am glad one was around when you needed him. Oh my goodness, my heart is pounding! Yay for good people. Most importantly I hope you are ok and not too shaken by the whole incident. Phones can be replaced but your nerves, trust and innocence can't be. I am so glad this story had a happy ending, very inspirational. i have always worried about that! i let my daughter watch a video on my ipod and i just know someone is going to rip it out of a little girls hand! i bought a case that has a lanyard on it though, so maybe they'll be deterred ; ) doubt it. . .
Wow! That boy messed with the wrong person. I'm sure he learned his lesson too! Good job! Oh my goodness! I am so glad you got it back. SHUT. UP. Are you serious? I'm so glad you're taking the class. I couldn't do mine this semester with two work trips coming up. Quel drama! You are one lucky girl to get it back like that. OMG. That is my greatest fear. I always keep mine tucked away so no one can see it. Samaritan Neil is the greatest! Hooray for Neil! What a great guy! I'm glad you got your phone back. Holy crap, the balls some people have. Glad you there is a happy ending to the story and you didn't get hurt. The class sounds so fun, wish Seattle wasn't so far to drive or I'd join you. Hot damn! Glad you got your phone back and at least someone was willing to help out. I can't believe people have the audacity to steal a phone right out of someone's hands like that, actually I really can't believe people have the audacity to steal but that's another point. I'm glad you got it back, I'm guessing you were wearing reasonable footwear? Or does adrenaline surpass shoes? Thank goodness you got your phone back! And thank goodness for Neil! Don't you often wonder why people just stand still and do nothing? But I'm glad it all worked out in the end and that YOU are okay! Woo hoo!! - I am so excited to win this magazine - Thanks Christina for running the draw - I am glad you are enjoying your pattern making class. I'm glad you got so lucky with your phone. If only there were more Neils in our world! Your patternmaking class sounds so exciting. I can't believe no one else tried to help! I'm so glad you got it back. I've been thinking about getting one--the temptation of having internet everywhere is really strong--but sheesh!!! Your class sounds so cool and exciting! Thank goodness for good Samaritans. It's amazing how people just don't do anything; but they don't. Ever. Humans are so odd. I know studies have been done about this, and it's apparently something to do with people being reluctant to stand out in a crowd,even if something unarguably horrible & needing action just happened. I'm glad you got your phone back & that there was someone there who helped. Also that you didn't get hurt in the attack. Wow, I'm happy for you that you got your phone back. I think I would've been too much like "huh? what just happened? HEY!!!!" And yeah, that's a crowd for you. I don't know if people stand around because they're in such disbelief or what....rather than taking action. I have a few things on my sewing list this season. Right now I'm working on a geisha costume, so that's my top priority. But as far as garments, I have a burda jacket planned (burda 7860), a suit for my mom, and a winter jacket for her too. Oh yeah, and x-mas decorations, yikes, I better get going.